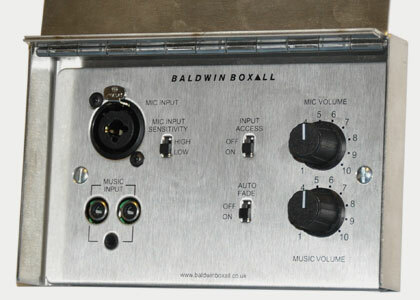 A room panel enables local control of audio facilities – useful for hotel/conference rooms and many other applications. There are two versions of the VIGIL room panel, adding more options to our EVAS voice alarm and public address systems. Connection to the main EVAS control rack is via CAT5. Provides control of local audio settings – volume, music source, etc. Emergency broadcasts from the EVAS voice alarm system will override the room panel settings. Controls broadcast volume for local area. Six position channel select control. USB socket on the rear of the panel for initial configuration. Enables connection of music source and/or mic for local broadcast. Microphone connector is a 3-pin XLR/6.35 mm jack socket. Two phono sockets and 3.5 mm jack socket. High/low sensitivity switch for microphone.